Although it was once the largest city in the world, the capital of the greatest empire in the world and now the centre of the Christian world, Rome is a relatively compact city by modern standards. This is great news for the visitor as the majority of its most famous sites are within walking distance of each other. But, as any long-term resident will tell you, it’s a far more accessible, liveable city than ever before. It’s also a more organised city, as the efficient welcome extended to the millions who flocked here after the death of Pope John Paul II has proven. 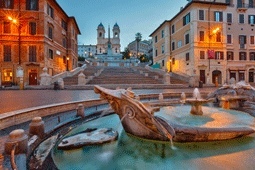 Known as the ‘Eternal City’ there’s really only one way to find out why, and that’s to visit it. 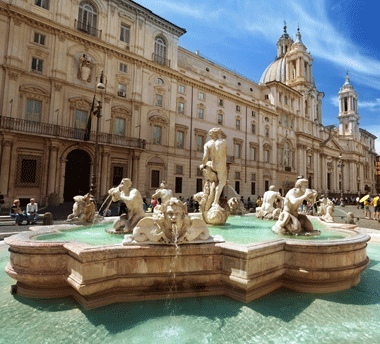 It’s fascinating, captivating, enchanting and stylish; if it’s history and religion, shopping and food, or just a break away from it all, Rome fits the bill nicely. In former days there were few choices in the dining experience in Rome – posh restaurants, humble trattorias or no-frills pizzerias - while today there are wine bars, salad bars, gastropubs, designer restaurants and deli-diners. The traditional categories have broadened: posh restaurants are going minimalist, new trattorias are creative rather than humble and the unchanging pizzeria has been shaken up – take, for example, the Dar Poeta. Eating in Rome used to be a bargain, however, inflation and opportunism in general have put paid to this, though the bill will still compare favourably with a similar dining experience in Dublin. For wonderful food, great surroundings, attentive staff and very affordable prices head to La Scala Restaurant in Piazza della Scala, Trastevere. 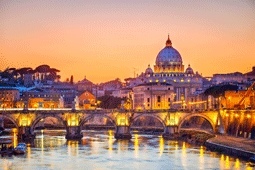 Simply cross the Ponte Sisto bridge (to the Vatican side) – the Piazza della Scala is behind the buildings in front of you – you are about a three, four, five minute walk from the restaurant. The food is simply delicious – everything we ate there was fantastic; in fact, it was so good we went back the next day! Have a look online at www.ristorantelascala.it. Osteria Ponte Sisto, Via Ponte Sisto 80, Rome. Caters mainly for the Romans themselves, so don’t tell anyone you know about this place! Neapolitan cuisine with a menu that changes often. Just outside the tourist zone – cross the Ponte Sisto Bridge (onto the Vatican side of the river), continue across the small square (Piazza Trilusso), and you’ll see it on your right. Dar Poeta, Vicolo del Bologna 45, Rome. Dar Poeta does good quality pizza with creative toppings. The varied bruschette are first-rate and healthy salads offer a break from pastry. Be prepared to queue, as they don’t take bookings. Luzzi, Via Celimontana, Rome. Decent pastas and pizzas are available at this busy little restaurant. It’s cheap and cheerful. 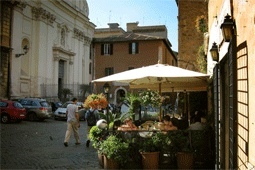 While the Italians do not treat their alcohol like we do, bar (or café) life is very much a part of life in Rome. Druid’s Glen, Via San Martino ai Monti, 28, Rome. The Druid’s Glen offers you that home from home treatment – an Irish pub in Rome, if you’re homesick drop in. Finnegan Pub, Via Leonina, 66, Rome. Again, an Irish pub in Rome, Finnegans serves a good pint and you can watch the football as well. Fluid, Via del Governo Vecchio 46/47, Rome. Classy, chic, modern and hip – an ultra-sleek designer bar. There is a scarcity of shopping malls and department stores in Rome but for very expensive chic merchandise head for Via Borgognona and Via Condotti, both close to Piazza di Spagna. Via del Corso is where you’ll find threads and styles aimed at the younger consumer while close-by on Via Francesco Crispi you should find unusual and less expensive gifts. Between these two streets is Via Frattina where part of the street is closed to traffic and the concentration of shops is densest. Leonardo da Vinci Airport, better known as Fiumicino, is the main airport in Rome. Two train services link Fiumicino with central Rome, one leaves every hours and arrives at the central Stazione Termini while the other leaves every 20 minutes and links Fiumicino with Trastevere, Ostiense and Tiburtina stations. 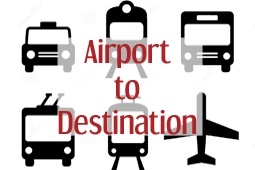 A Taxi service from Fiumicino to the city centre is available.